This is a departure from my usual posts but after sharing the fruits of my labour on Twitter and Instagram, I got so many requests for the pattern that I had to share it. After taking stock of the waste I create, I’ve been trimming down on single use products wherever possible. 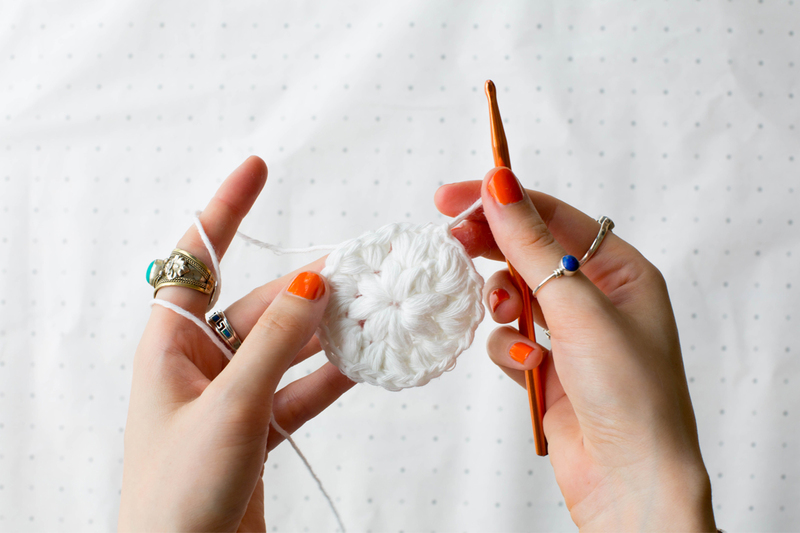 Given that I was using – and therefore binning – two cotton pads a day when I applied my toner, it made sense to come up with a reusable alternative, so I set to work with my crochet hook. The result is handmade cotton pads that are super soft and, more importantly, completely reusable. Just pop them in a mesh bag and stick them in with your usual white or light colour wash.
Yarn over, insert your hook, yarn over and pull up a loop, leaving plenty of slack. You’ll now have three loops on your hook. Then, yarn over into the same stitch and repeat the process three more times until you have nine loops on your hook. Yarn over one final time and pull through all nine loops. Ch1 to complete and secure the stitch. Ch5 and sl st into the first ch to create a loop. YO into the middle of the loop and create a PS. Ensure you leave plenty of slack as pictured otherwise you’ll struggle to pull your hook through all of the loops. Repeat the PS seven more times, so you have 8 in total. Ch1. Work two PS into the spaces between each of the first row PS, creating 16 in total. Secure with a sl st.
Snip the yarn, leaving a tail, and weave in the end with your yarn needle. And it’s as easy as that. Light, fluffy, earth-friendly cotton pads that you can use over and over. Such a good post! I started using fabric a while back with some cleanser to get make up off because I realised how many make-up wipes I use :(! Hello! I’ve been trying to do this but am finding it virtually impossible to get 8 puff stitches in the first row. Any tips? What ply cotton yarn do you recommend? I think I used a 4 ply cotton yarn to make them nice and chunky.